In July 2014, the land use law firm of Kassouni Law filed the opening brief in the important case challenging the Plan Bay Area’s Sustainable Communities Strategy adopted by the Metropolitan Transportation Commission (MTC) and the Association of Bay Area Governments (ABAG). Kassouni Law represents Michael Shaw of Freedom Advocates, Rosa Koire, and the Post-Sustainability Institute. MTC and ABAG were directed by law to craft a plan to reduce greenhouse gas emissions in the state to 1990 levels by the year 2025. However, the end result is a 150 page manifesto of social engineering run amok which will fail to hit its greenhouse gas emissions target. In November 2014, Alameda County Superior Court Judge Evelio Grillo issued a tentative ruling denying Petitioners’ request for the issuance of a writ of mandate halting implementation of the One Bay Area Plan in the matter of the Association of Bay Area Governments’ (ABAG) restructure of local government. A hearing was held shortly thereafter to discuss the tentative ruling. Petitioners’ counsel focused on the statutory requirement that the Sustainable Communities Strategy be “feasible.” The definition of feasible includes the requirement that greenhouse gas reduction be achieved within a reasonable period of time. ABAG offers no timetable for a feasible plan designed to transform the Bay Area in accordance with the “Strategies” law itself. Following the hearing, in January 2015, Alameda County Superior Court Judge Evelio Grillo issued his final ruling. Judge Grillo changed his tentative ruling based on the arguments presented by the Petitioners in the November hearing. He sidestepped the feasibility issue, and he did not address the legality of the COG. Ultimately the Trial Court Judge ruled against the Plaintiffs in the war over protecting cities and counties from a transformation of local government, but for different reasons. Read the Final Ruling here. We lost at trial, as the Trial Court gave the go-ahead to the remaking of the structure of the California government. 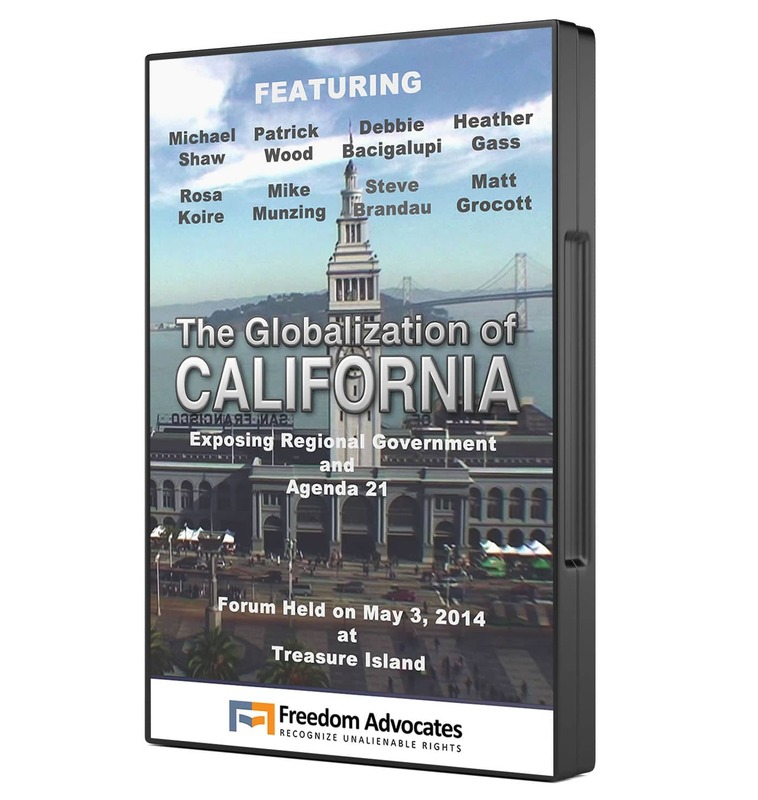 Both the Trial Court and the State Legislature have had a hand in the remake of the California government. The Legislature is remaking the government and the Trial Court is authorizing it, without any Constitutional authority or public awareness. The Bay Area cities have been lured to remake their zoning ordinances in order to qualify for receipt of a share of Plan Bay Area’s $16 billion ‘start up’ fund, which has been distributed by ABAG to 100 cities in the Bay Area. The One Bay Area Plan intends for the San Francisco Bay Area to become the first American City-State (see video here). As the Bay Area goes, so will Los Angeles and then San Diego. In a result oriented decision, Alameda County Superior Court Judge Evelio Grillo ruled against the Plaintiffs in the war over protecting Cities and Counties from a transformation of local government (One Bay Area). 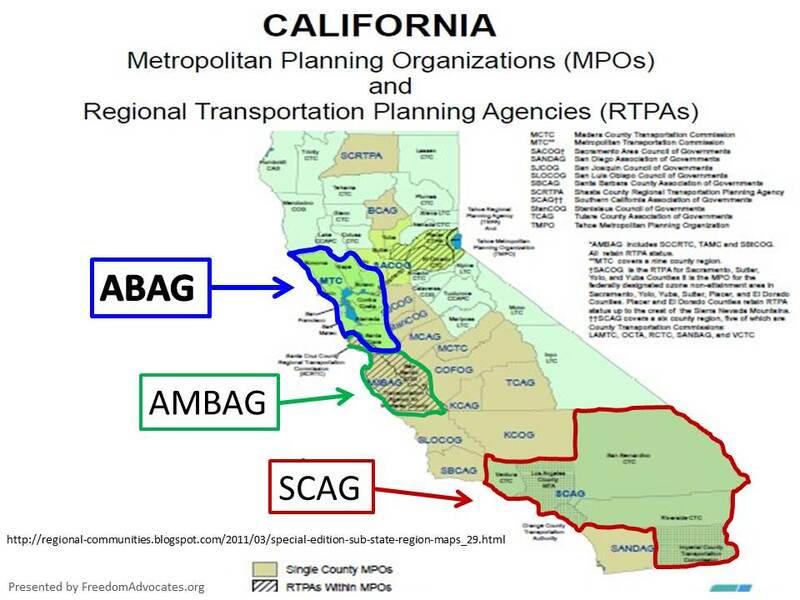 The new form of government in the San Francisco Bay Area is run by ABAG (Association of Bay Area Governments). 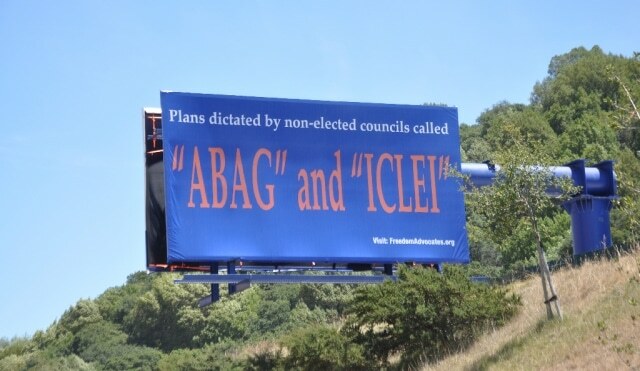 ABAG has jammed a $300 billion national taxpayers funding program that extorts all 101 cities and 9 counties in the Bay Area. ABAG is a COG (Council of Governments). COGs are directed and funded by the federal government and are extra-Constitutional. 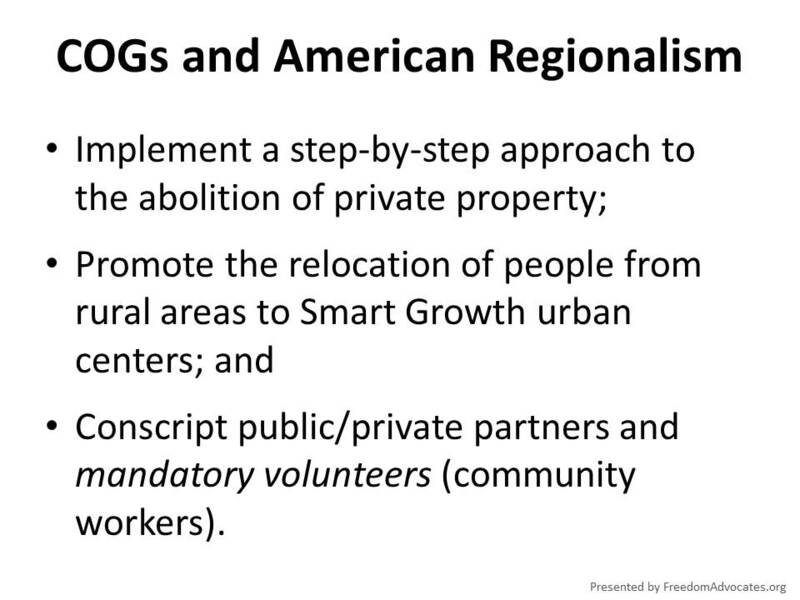 Total transformation is the Agenda – including massive stack and pack housing on 3% of the area’s land mass, abolition of private property, public transportation in replacement of private auto use and attacks on rural housing – pure Agenda 21 and “justified” on the basis of ‘climate change.’ A convenient excuse for restructuring government! As the Bay Area goes, so will Los Angeles and then San Diego. The Bay Area cities have been lured to remake their zoning ordinances in order to qualify for receipt of a share of One Bay Area’s $16 billion ‘start up’ fund to be distributed soon by ABAG, unless there is Court intervention. The One Bay Area Plan intends for the San Francisco Bay Area to become the first American City-State (see video here). Newspapers in the Bay Area essentially do not report on the transformation. The public is unaware. COGs came to California by decree of then Governor Ronald Reagan, who declared as justification: “The era of horse and buggy government is over.” Liberal politicians + Conservative politicians = Globalists. 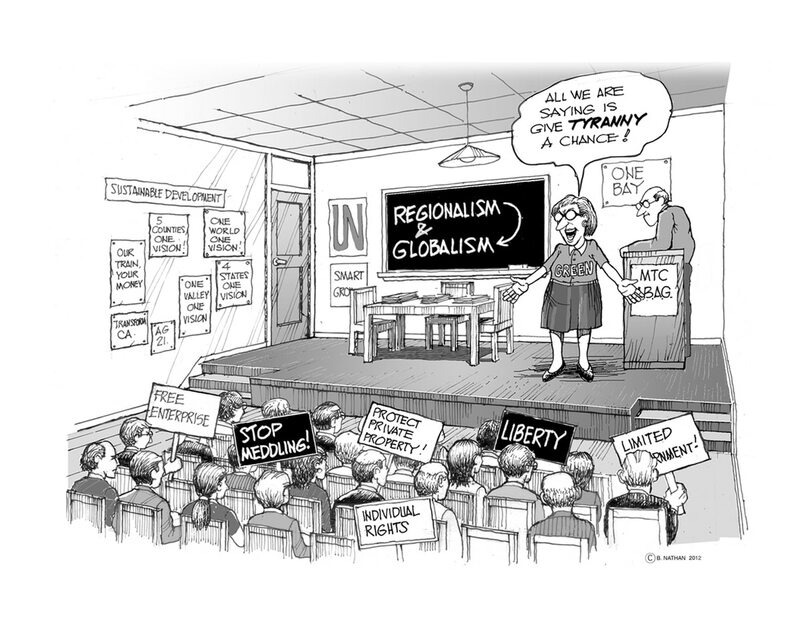 The real battle is Globalism vs. America. Where do you stand? 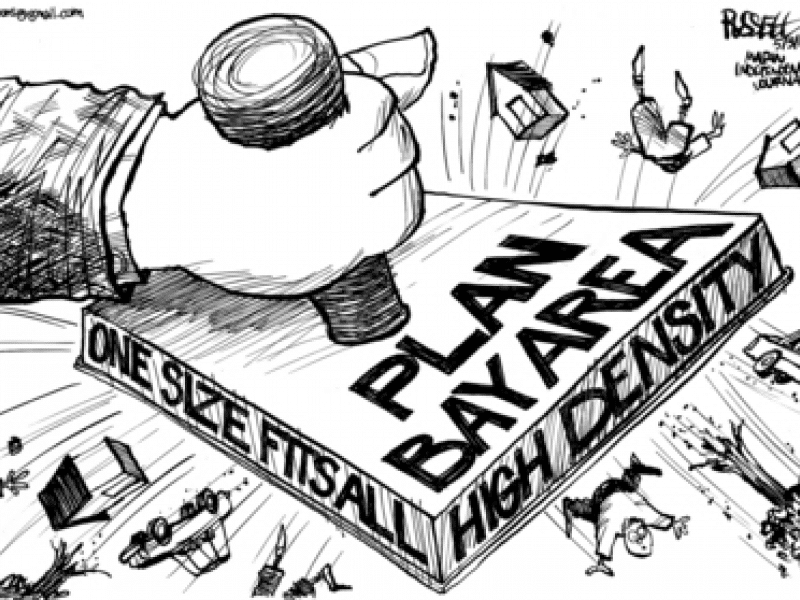 On Friday November 7, 2014, Alameda County Superior Court Judge Evelio Grillo issued a tentative ruling denying Petitioners’ request for the issuance of a writ of mandate halting implementation of the One Bay Area Plan in the matter of the Association of Bay Area Governments’ (ABAG) restructure of local government. On Monday November 10, 2014, a hearing was held in the Superior Court of the State of California (Alameda County) to discuss this tentative ruling. Petitioners’ counsel focused on the statutory requirement that the Sustainable Communities Strategy be “feasible.” The definition of feasible includes the requirement that greenhouse gas reduction be achieved within a reasonable period of time. In its briefing, ABAG never presented a feasible plan nor addressed the issue of the timing for their “Strategies” implementation. Currently, ABAG merely concludes the project is feasible despite the fact that their planning consultant offered no evidence to support ABAG’s conclusion. ABAG recites a number of new laws will have to be passed before the Plan can be fully implemented. This list includes gutting Proposition 13. Is that feasible? ABAG offers no timetable for a feasible plan designed to transform the Bay Area in accordance with the “Strategies” law itself. Further, consider: ABAG’s judicially relevant assertion that their funding of One Bay Area (OBA) is 5% of federal funding issued to this geographic area. This perspective misleads the relevant fact that ABAG funding of OBA totals 50% off all discretionary federal payments to this area! As a consequence, Cities and Counties are coerced into participation by the force of these lost dollars. There are more issues raised on the record linked below. The Court asked Mr. Kassouni to further brief the issues presented that day (Read Brief here). It was an interesting Hearing! Michael Shaw of Freedom Advocates, Rosa Koire, and The Post Sustainability Institute file Complaint seeking to negate ABAG’s One Bay Area Plan. On July 15, 2014, the land use law firm of Kassouni Law filed the opening brief in an important case challenging the Plan Bay Area’s Sustainable Communities Strategy adopted by the Metropolitan Transportation Commission (MTC) and the Association of Bay Area Governments (ABAG). Kassouni Law represents Michael Shaw of Freedom Advocates, Rosa Koire, and the Post-Sustainability Institute. MTC and ABAG were directed by law to craft a plan to reduce greenhouse gas emissions in the state to 1990 levels by the year 2025. However, the end result is a 150 page manifesto of social engineering run amok which will fail to hit its greenhouse gas emissions target. The plan over time will drastically reduce if not outright ban the development of many vacant parcels in the Bay Area, thereby forcing residents to work and live in small, high density Priority Development Areas (PDAs). Not only that, important environmental protections provided by the California Environmental Quality Act (CEQA) will be eliminated for favored developers who build in these PDAs, creating serious equal protection and environmental concerns. Federal transportation funds administered by MTC will be withheld from cities and counties unless they agree to the draconian land use restrictions imposed, bribery in common parlance. An independent study prepared for the government by Economic Planning Systems, Inc. (EPS.) has concluded the Plan is infeasible, as it relies on a number of legislative and Constitutional changes, including the repeal of Proposition 13, which has helped keep property taxes in check for 40 years, and which has also restricted the state’s ability to raise taxes without a 2/3 super majority vote. Even if the plan is adopted, any positive effects on the environment will be virtually nil according to studies performed by the Environmental Protection Agency. Further, given the CEQA modification for PDAs, the impact on the environment may be negative. It is hoped that the Alameda County Superior Court, where the case has been filed, will see through the charade of sustainable development and restore common sense for the people of California. Read the opening brief in its entirety here. The Los Angeles and Sacramento land use lawyers at Kassouni Law can be reached at (877) 770-7379. ABAG’s response to our Opening Brief was received on Friday, August 29, 2014. The government’s response demonstrates bureaucratic overload. Petitioners’ Reply: How this bureaucracy has demonstrated its excess.